We’ve all heard of SMART goals, but often teams focus on these so much that they lose sight of the bigger picture! 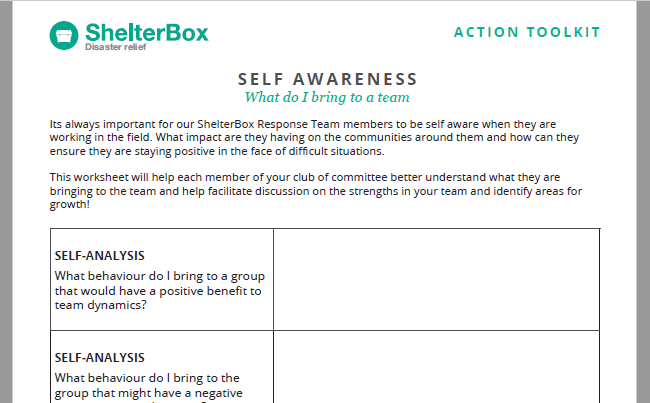 At ShelterBox we believe that it is important to keep the goals impact in mind while you set goals. Use this worksheet to see where your impact is. Are your current goals output or outcome focused? At ShelterBox, communication is key! We need to ensure that our Response Team Members are communicating effectively with our partners and other aid organizations in the field. 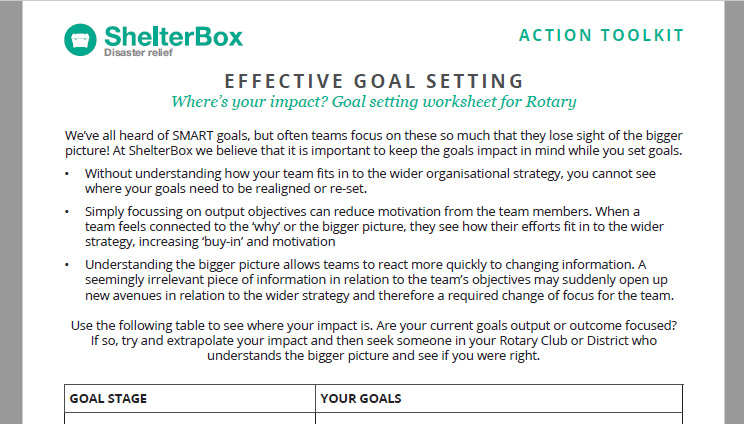 Use this worksheet to create a communication plan for your Rotary Club, District or Club committee. What do I bring to a team? Its important for our ShelterBox Response Team members to be self aware when they are working in the field. What impact are they having on the communities around them and how can they ensure they are staying positive in the face of difficult situations. This worksheet will help each member of your club or committee better understand what they are bringing to the team and help facilitate discussion on the strengths in your team and identify areas for growth! Create an open culture, how did we do? An important part of growth and goal setting is effective feedback and reflection. At ShelterBox we are constantly working to improve and receive feedback from our partners, affiliates and most importantly our beneficiaries. 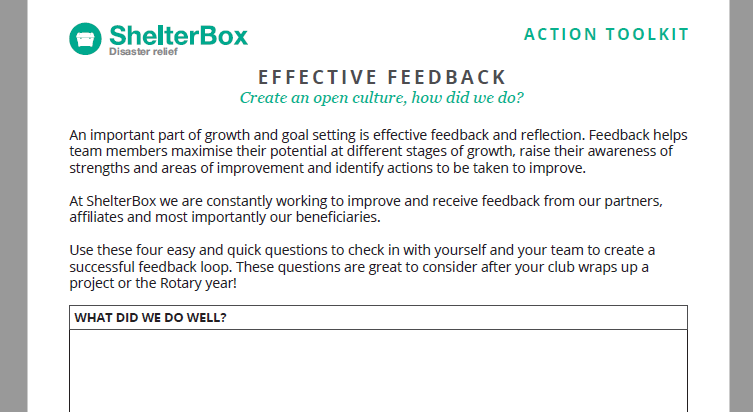 Use this worksheet as a quick and easy way to check in with yourself and your team to create a successful feedback loop. How can we move from forming to performing? 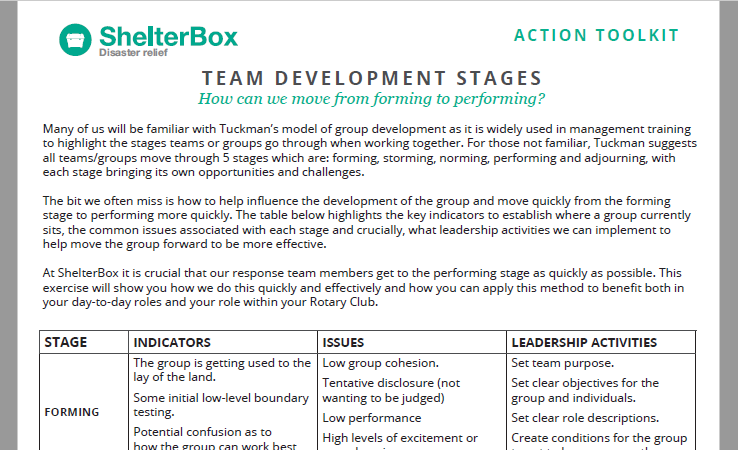 Many of us will be familiar with Tuckman’s model of group development to highlight the stages teams or group go through when working together. The bit we often miss is how to help influence the development of the group to move quickly from the forming stage to the performing stage. At ShelterBox it is crucial that our Response Team members get to the performing stage as quickly as possible. This exercise will show you how we do this quickly and effectively and how you can apply this method to your day-to-day roles and your role within Rotary.